​The Spartoi were armed warriors who sprang from the ground when the teeth of a dragon were sown into the earth, hence the name Spartoi means “sown men”. The Spartoi are prominent in two tales for they appear in the adventures of both Cadmus and Jason. The story of the Spartoi begins in the land that would become known as Thebes, for Cadmus had followed a cow to this spot, and it was decided that a city would be built here. Cadmus instructed the men of his company to fetch some water, to enable the sacrificing of the cow. Unbeknownst to Cadmus and his men, the spring from which the water was to be collected was guarded by a dragon, and this dragon killed all of Cadmus’ men. Cadmus would eventually go looking for his men, and finding them slain, would kill the dragon which had killed them. The act of killing the dragon, the Ismenian dragon, would have an adverse impact upon Cadmus later, but for now Cadmus was at a loss to know what to do, for he had found the site on which to build a city, but now had no men to build it. 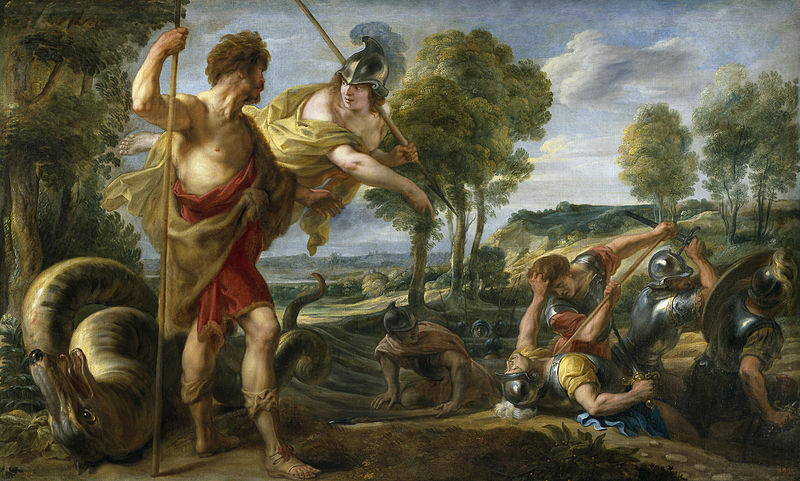 Cadmus was being guided by the goddess Athena, and it was the goddess who told Cadmus to remove the teeth of the Ismenian dragon and divide them into two equal piles. Athena took one pile of dragon’s teeth, whilst the goddess then told Cadmus to sow the remaining teeth. Cadmus did as commanded but from each sown tooth emerged a fully armed warrior (not the skeletons of the Harryhausen depictions). ​​Fearing for his life, Cadmus threw a stone amongst the Spartoi, and the Spartoi began to fight amongst themselves, for each felt that another Spartoi had attacked them. Occasionally, it was said that Cadmus killed several of the Spartoi before throwing the stone in their midst. Eventually, only five Spartoi were left alive. The five Spartoi who remained were named Chthonius, Echion, Hyperenor, Pelorus and Udaeus; and Echion was regarded as the leader of these Spartoi. The surviving Spartoi would put down their weapons and assist Cadmus with the building of a new city. Once constructed, this city would become known as Cadmea; it was only several generations later that the city would be renamed as Thebes. Cadmus would have to serve a period in servitude to Ares for the slaying of the Ismenian dragon but then he would marry Harmonia, and become father to a son, Polydorus, and four daughters, Agave, Autonoe, Ino and Semele. ​The royal family line of Thebes was established but the five Spartoi, Echion, Chthonius, Hyperenor, Pelorus and Udaeus would become the ancestors of the five noble houses of Thebes, and all prominent members of Theban society would trace their lineage back to these original Spartoi. In Greek mythology Echion would marry Agave, daughter of Cadmus, and it was their son Pentheus, who became ruler of Thebes (Cadmea) after Cadmus abdicated, for it was said that Polydorus was not of age. Pentheus would act as regent of Thebes until his own death; and Polydorus would then become ruler. Descendants of the Spartoi would act as regents of Thebes at various times in the city’s history, with Lycus and Nycteus, both being said by some to be sons of Chthonius, whilst Creon was a great-grandson of Echion. It was said that the descendants of the five Theban Spartoi could be identified by a birthmark (either a spear or dragon shaped birthmark). ​The Theban Spartoi of course emerged from just half of the teeth of the Ismenian dragon, with Athena taking the other half. These remaining teeth passed into the ownership of Aeetes, king of Colchis. When Jason came to Colchis, with the other Argonauts, to take the Golden Fleece, Aeetes gave to the Greek hero several deadly tasks to perform first. Jason was thus tasked with yoking the fire breathing automaton bulls to plough the field of Ares, and then Jason was told to sow the dragon’s teeth in the ploughed soil. Medea, as well as telling him how to safely yolk the beasts, also told Jason what would occur when the teeth were sown, and how to best deal with the Spartoi that emerged. Thus Jason did exactly as Medea advised, and when the Spartoi emerged from the earth, he, like Cadmus before him, threw a stone in their midst before they caught sight of him. As with the Theban Spartoi, these Colchian ones began to fight amongst each other, and as their numbers began to dwindle, Jason emerged from where he was concealed to deal killing blows to those that remained alive. Thus, no Colchian Spartoi survived their meeting with a Greek hero.